Living Values Education provides an approach, and tools, to help people connect with their own values and live them. During professional development workshops, educators are engaged in a process to empower them to create a caring values-based atmosphere in which young people are loved, valued, respected, understood and safe. Educators are asked to facilitate values activities about peace, respect, love and caring, tolerance, honesty, happiness, responsibility, simplicity, caring for the Earth and Her Oceans, cooperation, humility, compassion, freedom and unity to engage students in exploring and choosing their own personal values while developing intrapersonal and interpersonal skills to “live” those values. The sixteen values units in the updated Living Values Education Activities books include many other related values such as kindness, fairness, determination, integrity, appreciation, diversity, gratitude, inclusion and social justice. Students soon become co-creators of a culture of peace and respect. A values-based learning community fosters positive relationships and quality education. For assistance contact us - Click here to email - or your closest Associate or Focal Point found in the Contact Us section. In each book, these values and others are explored using age-appropriate lessons that incorporate group discussions, reading, quiet reflection time, songs, artwork and action-oriented activities. The Living Values Education approach and these activities are in use in thousands of locations in more than forty countries. Educators note an increase in respect, caring, cooperation, motivation, and the ability to solve peer conflicts on the part of the students. Aggressive behaviours decline as positive social skills and respect increase. Living Values Education helps educators create safe, caring, values-based atmospheres for quality learning. The Living Values Education Series, a set of five books first published in April of 2001 by Health Communications, Inc., was awarded the 2002 Teachers’ Choice Award, an award sponsored by Learning magazine, a national publication for teachers and educators in the USA. Materials from the books, and in some cases up to all five of the books, have been published in at least a dozen languages. FREE DOWNLOAD – eBooks download for reading online or self-print option. 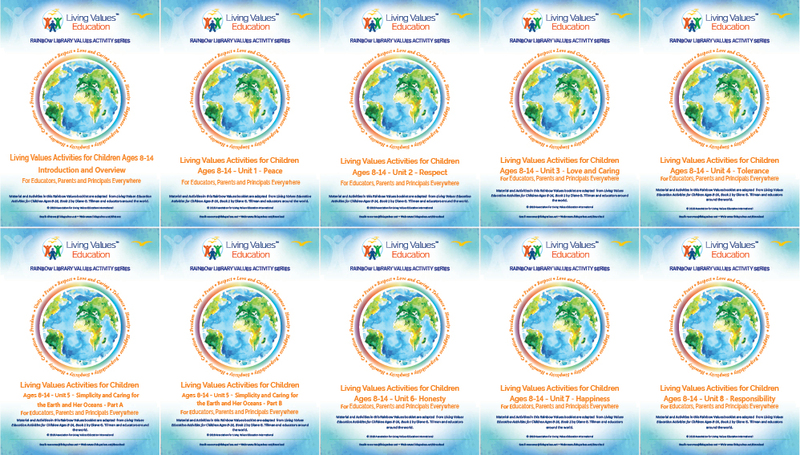 In 2018, the Association for Living Values Education International began updating this initial set of five books. Building on the original material, updated information, an expansion of activities and additional values units were added. Because of the amount of added information, the original three Living Values Activities books are published by ALIVE as two volumes, Book 1 and Book 2. ALIVE’s intent in separating from HCI, our esteemed publisher, was to make these educational resources more accessible to educators in all continents by offering the series not only as regular books but as eBooks and small free downloadable units. In Living Values Education Activities for Children Ages 3–7, Ages 8–14, and Living Values Education Activities for Young Adults, reflective and imagining activities encourage students to access their own creativity and inner gifts. Communication activities teach students to implement positive, constructive social skills. Artistic activities, songs, and movement inspire students to express themselves while experiencing the value of focus. Game-like activities are thought provoking and fun; the discussion time that follows those activities helps students explore effects of different attitudes and behaviours. Other activities stimulate awareness of personal and social responsibility and, for older students, awareness of social justice. The development of self-esteem and tolerance continues throughout the exercises. Educators are encouraged to utilize their own rich heritage while integrating values into everyday activities and the curriculum. The aforementioned updated Living Values Education Activities books have sixteen values units, eight in Book 1 and eight in Book 2. This allows schools to easily plan to implement one value a month during the school year, rotating through eight values a year. The universal values explored in all three books are peace, respect, love and caring, tolerance, honesty, happiness, responsibility, simplicity and caring for the Earth and Her Oceans, cooperation, humility, compassion, freedom and unity. The value unit exploring freedom for children ages three to seven is titled “Brave and Gentle”. There are two values units on both peace and respect as these values are so important to young people and present the opportunity to help them build important intrapersonal and interpersonal social and emotional skills. It is recommended that educators in schools begin with the Peace I and Respect I values units in Book 1 during the first year of implementation and Peace II and Respect II values units in Book 2 during the second year, rotating through eight values each year. The sixteenth values unit is titled “Another Value We Love”. This offers activities on a few values and an invitation to educators to explore a value they feel is needed locally or nationally. The sixteen values units in the updated Living Values Activities books also include many related values such as kindness, fairness, determination, integrity, appreciation, diversity, human rights, valuing education, trust, gratitude, inclusion, equality and social justice. This guide contains the variety of workshops found within LVE Educator Trainings. Sessions include values awareness, creating a values-based atmosphere, values activities, and skills for creating such an atmosphere. LVE's theoretical model and the rationale behind the variety of activities is presented. Sample training agendas are offered for one-, two-, and three-day educator training programs and a five-day train-the-trainer session. This book offers both process and content for facilitators interested in conducting Living Values Parent Groups with parents and caregivers to further understanding and skills important in encouraging and positively developing values in children. There are three sections. The first section describes content and activities for an introductory session, and a six-step process for the exploration of each value. In this process, parents and caregivers reflect on their own values and how they "live" and teach those values. The second section offers suggestions regarding values activities the parents can play in the group, and ideas for parents to explore at home. In the group sessions, parents play the games their children will play and learn additional methods to foster value-related social and emotional skills at home. In the third section, common parenting concerns are addressed, as are particular skills to deal with those concerns. There is a small section on the needs of children from ages 0 to 2. Diane Tillman is the primary author of the Living Values Education series of books. Diane G. Tillman is the primary author of the award-winning Living Values Series of five books, and ten additional educational resources, including Living Values Activities books for street children, children affected by war, young offenders, at-risk youth and young people in need of drug rehabilitation. A Licensed Educational Psychologist and Marriage and Family Therapist, Ms. Tillman worked in a California public school system for 23 years as a School Psychologist. She has worked with Living Values Education since its inception in August of 1996, and continues to develop content and training materials. Additionally, she has authored a children’s book and a parenting guide, “Nurturing with Love and Wisdom, Disciplining with Peace and Respect”. Tillman has travelled to more than 30 countries in all regions of the world to conduct professional development workshops and LVE seminars at conferences, retreat centres and refugee camps, for educators, UNESCO, street-children agencies and Ministries of Education. She is on the Association for Living Values Education International (ALIVE) Board of Directors. Diana Hsu is the co-author of Living Values Education Activities for Children Ages 3–. Diana Hsu was a teacher who worked with children two through fourteen years of age for 24 years in Germany, Hong Kong, Singapore, and the United Kingdom. The activities and stories she contributed were field tested in several countries. She enjoyed writing stories for children, and working with them and educators before her death several years ago. Always shining with love and cooperation, we love her and miss her. Pilar Quera Colomina is the co-author of LVEP Educator Training Guide. Pilar Quera Colomina has worked with Living Values Education since its inception in August of 1996. She is a past-president of the Association for Living Values Education International and a former Living Values Education Coordinator for Spain. Pilar taught in public schools for 30 years and works in the Department of Education for the Government of Catalonia. She is a Director of the educational books collection Micro-macro references Editorial Gra and does consulting, training and coaching in education systems (public and private), organizations and governments. Pilar is also the author of Manual para Educadores I and II. Pilar has travelled extensively in South America to conduct LVE seminars. Trish Summerfield is the co-author of Living Values Activities for Drug Rehabilitation. An educator from New Zealand who has been residing in Vietnam, Trish Summerfield is the former Living Values Education Coordinator for Vietnam. The co-author of Living Values Activities for Drug Rehabilitation, she has conducted numerous trainings throughout Vietnam for private and government rehabilitation clinics. She also created a very successful TV program based on the Living Values Activities books. In the programs, teens discuss values and enact activities. Trish is an International Lead Trainer for the Association for Living Values Education International and has conducted regular LVE workshops, Train-the-Trainer seminars and at-risk trainings for street children agencies, refugees and children affected by war and trainings for other at-risk groups in several regions of the world. Our appreciation to the educators around the world who have contributed activities to the Living Values Activities books. In all the books their names are noted under each story or activity contributed. Living Values Education welcomes your suggestions and invites participation at all levels. When viewed as an ongoing process, values-based education becomes part of a lifelong learning experience. Many opportunities can be found to integrate values-based education into existing curricula. These will vary from place to place according to cultural needs. It is in the spirit of cooperation that Living Values Education was founded, recognizing we learn from one another. We would like to thank all those who have contributed their time and energy to the LVE Approach.